After their discovery Tuesday night, the four friends, who comprise the local rock band Stereo Fire Empire, carried the paintings to the 8thDistrict police station three blocks away. There, they were greeted with understandable incredulity, Diez said. Police commander Jeff Walls said the band mates are considered good Samaritans, with no reason to suspect them of wrongdoing. At the same time, “we will look at everybody” in trying to identify the thief, Walls said. “We will definitely follow up to make sure we check into their history, and also if they were possibly involved,” Walls said. The discovery of “Three Amigos” is a mystery. 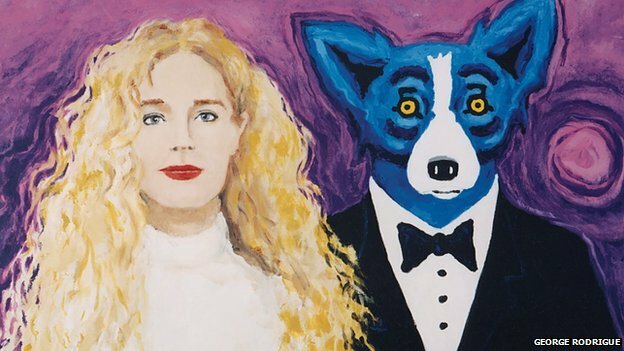 Jacques Rodrigue, the artist’s son, said the George Rodrigue Foundation of the Arts sold it three or four years ago to a non-profit organization. The foundation does not have records as to which organization purchased it, Rodrigue said. The painting was sold unframed, he said, but the frame Diez and his friends found it in contains identifying information. HAHAHAHA! we are in a band. of course we wear Chucks. Great article. Even if you do think we are “highly suspicious”. Thank you anyway for the article. Security measures such as CCTV cameras, recorders, and fingerprint protected access control systems ensure legal help if things go wrong. CCTV recording maybe entered as evidence with the police and often helps them track down miscreants. CCTV in different places in your establishment acts as a monitor and allows you access to any unprofessional behaviour at work.